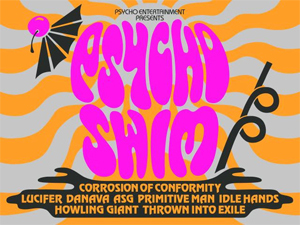 Early bird tickets for PSYCHO SWIM are $35 plus fees. Once sold out, tickets will be $45 plus fees. High Rollers get access to the pool party with their VIP pass. PSYCHO LAS VEGAS, notorious for its consistently stacked lineups, remains unmatched in its level of presentation and 2019 promises not only a bigger and better festival but the experience of a lifetime. The event will feature four stages, including the newly renovated Mandalay Bay Events Center, the iconic House of Blues, Mandalay Bay Beach, featuring a wave pool and lazy river, and Rhythm & Riffs - a Vegas-style lounge in the middle of the casino floor. With an already jaw-dropping bill of rock and metal luminaries including Electric Wizard, Godspeed You! 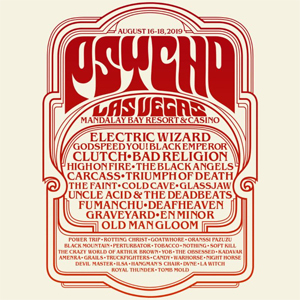 Black Emperor, Clutch, Bad Religion, High On Fire, and more than three dozen others, PSYCHO LAS VEGAS will announce its final lineup later this month! Stay alert. The highly-coveted "Psycho Special" passes and "High Roller VIP" passes are now sold out, however "Tier 1 Weekender General Admission" passes are still available at $249 but will increase to $299 once the first tier sells out. Single-day tickets priced at $109 will be available in the coming weeks. All ticket prices are exclusive of taxes and fees.